A common question we are asked as professional roofers is, “How do I know when it’s time to replace my roof?” That is an excellent question to be asking because waiting too long could be a costly mistake. Here’s a roofers take on when it is time to replace your roof. Are you near the end of the life rating of your shingle? Asphalt shingles are given a life rating in years to indicate how long they might last. Usually, this rating is anywhere from 25 years to 50 years. The life rating doesn’t always mean that your roof will remain good for that long. It is, however, estimated that an average asphalt shingled roof will last between 20 and 30 years. If your roof has been installed for more than 20 years, you should consider having your roof inspected to see if it is time to have it replaced. 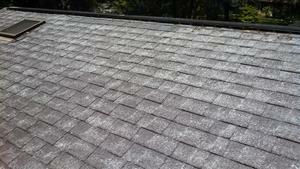 Do your asphalt shingles look ‘Shiny’? Another sign that a roof is needing replacement is if the roof looks shiny when the light is hitting it. Inside of every asphalt shingle are hundreds of tiny fiberglass fibers. As the asphalt begins to break down, these fibers become exposed and reflect the light rays off of the roof. If you notice your roof is looking a little shiny, it is time to get it replaced. Do you see little rocks coming out of your rain gutters? As an asphalt roof ages, the rocks that give the roof it’s color will become loose. During periods of rain these rocks will wash down the rain gutters and onto the ground. If you notice large amounts of rocks beginning to come off of your roof, it may be time to have your roof replaced. 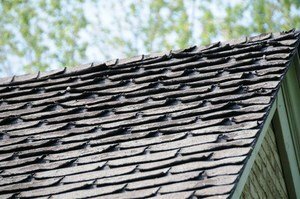 Are the edges of your shingles curling back? In Utah, our roofs are exposed to extreme temperature swings. We have extremely cold winters and extremely hot summers. These temperature extremes will weaken the integrity of the shingles on your roof and may cause the edges to curl back. If you notice any curling or lifting of the shingles on your roof, it is definitely time to get your roof replaced. There are also hundreds of other signs that it is time to have your roof replaced that are not easily seen without a thorough inspection of the roof. It is good idea to have your roof inspected by a roofing professional as it ages to help you determine when it may be time to consider replacing it. When performing an inspection, the professionals at American Prestige Roofing will always be honest with you about the condition of your roof and provide any recommendations about replacement or repairs. At American Prestige Roofing, we are the roofers you can trust.